Want Newspapers? Check the E-Library! There are those who have said that the newspaper is dead. While there has certainly been a decline in print dailies these past couple decades, we can argue that newspapers haven’t died, they just moved online! 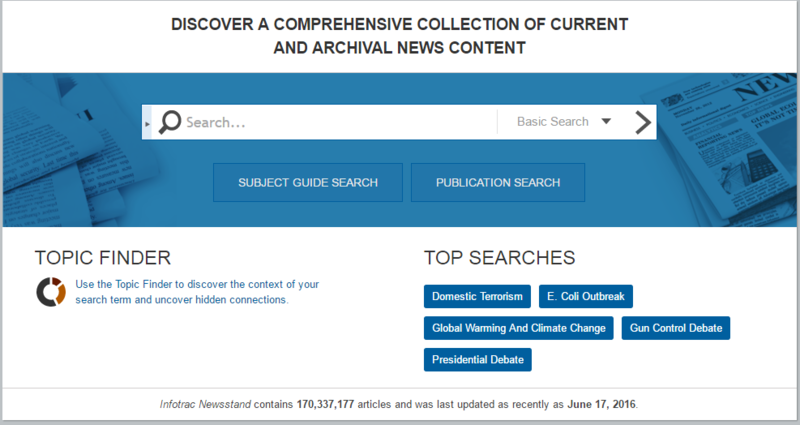 When you are tired of Googling and getting less-than-reliable news sources for information, check out the varied ways you can look at newspapers, both current and historic, through the library website. Need the New York Times? You need Infotracopens a new window. Powered by Gale, Infotrac Newsstand is a repository of several hundred national and international newspapers, including the Times from 1995 forward. Since it is a Gale product, you’ll start on a very similar landing page to what the other resources haveopens a new window. From there, you can search for a subject, or you can do a publication search. Within Publication Search, you can do your search, or you can have it list all of the publications that are available to you, and their parent companies. You can use the limiter on the right side to narrow your results, including what language you want the newspaper to be in, what topics you might want to cover, or the target audience, among many other things. These are also not just news articles. You can also find things like transcripts from 60 Minutes segments back to 2004, or magazines like The Advocate. You can also do general and advanced subject and keyword searches, just like with any other search engine or aggregated database. It’s all your call. Remeber Find a Topicopens a new window? Newsbank has a few different ways to access their information, depending on what your goals are. The default entry method is through the Newsbank Newspaper Articlesopens a new window pathway, which will take you to a landing page. Looking for the Arizona Daily Star? There’s a direct link to that on that landing page. Looking for national obituaries and death notices? There is a direct link to that as well (there’s also a separate pathway from the E-Library directly to this collection). General OneFileopens a new window is from the same suite of resources as Infotrac, but also gives you access to non-news resources. You might find some of the same publications here, but it’s only a portion of what you’ll find in Infotrac. While this databaseopens a new window is more geared towards finding particular articles, you can narrow your search down to newspaper as a publication type, so you know you’re getting news articles. And finally, the Arizona Digital Newspaper Program. The Arizona Digital Newspaper Programopens a new window is a product of the Arizona State Library, Archives and Public Records. It includes digitized versions of newspapers published in Arizona from the first, out of Tubac in 1859, to 1922, the last year of Public Domain. Anyone with an Arizona zip code can access this, not just Pima County Public Library cardholders. These newspapers have been digitized as-is in their full format, and in some cases the only surviving copies are pretty beat up. Also. the number of issues varies by the newspaper--some might have several dates, some only one or two. But the actual contents are pretty rewarding to anyone doing deep historic research on Arizona. Want more? Check out the Read Newspapersopens a new window section in the E-Library! Looking for other ways to read newspapers? Read about some of our physical collections hereopens a new window!